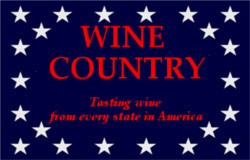 The Now And Zin Wine Country series will stay in Iowa a while longer, as some more wineries have provided samples of their Iowa wines. I was quite impressed with Iowa wine in my first encounter with it, and couldn't wait to try some more and see if the quality stayed high. Tabor Home Vineyards and Winery is owned by Dr. Paul Tabor, who is also the winemaker. His family farm in Baldwin, Iowa - 170 miles west of Chicago and 40 miles south of Dubuque - was a grain and cattle operation since the 1860s. A six-acre vineyard was planted in 1989 and the winery was built in 1996. 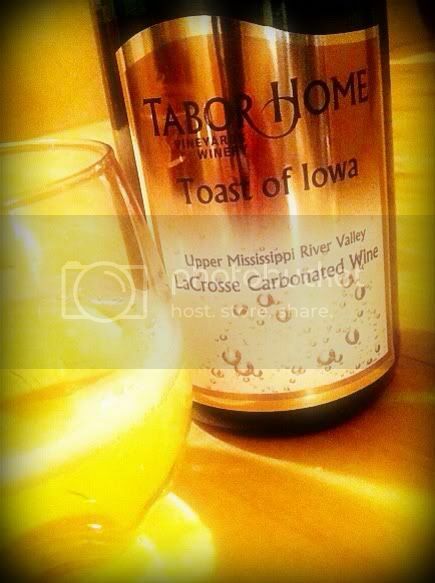 Tabor Home is located in the Upper Mississippi River Valley AVA, which covers nearly 30,000 square miles. AVA status was approved in 2009 for this region, snaking through northeast Iowa, northwest Illinois, southeast Minnesota and southwest Wisconsin. The soils of the area are generally clay and silt loam on bedrock and limestone. This sparkler is made from La Crosse grapes, 70% of which are grown in Tabor Home’s estate vineyard while 30% come from a grower 30 miles away. The 11.5% alcohol level is reasonable by anyone’s standards, and Dr. Tabor writes that he “kept residual sweetness lower (2.8% RS) so not to mask” the delicate fruit flavors of the La Crosse. The wine retails for $16 and comes with a bottlecap closure. The bottle has no punt, by the way. It's flat on the bottom. Not truly a sparkler, but definitely a bubbler, Toast of Iowa is labeled as a "carbonated wine." It has a very light tint in the glass and shows tons of bubbles at first, dissipating quickly. The nose is highly aromatic and yeasty with apricot fighting it out with an earthy minerality to come in second behind the yeast. The palate does feature a sweetness, but it's very restrained. The acidity is marvelous and flavors of apricot and golden plums rise up on the bubbles. An extraordinary Sweet Tart finish comes as a pleasant surprise. I would have thought La Crosse lovers would have liked a sweeter version of this, but I'm sure the doctor knows his market. It certainly hits me the right way. This is an estate wine, with all the grapes grown in the Tabor Home vineyard. 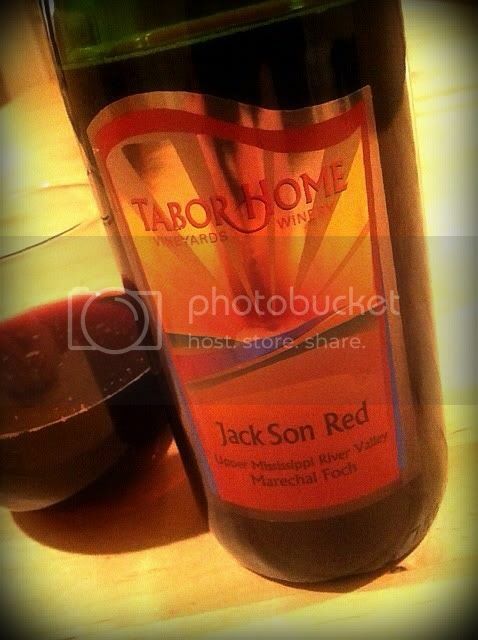 The name “JackSon Red” references the doctor’s father, Jack, as well as the winery’s location in Jackson County. Its alcohol is quite restrained, at 13.4% abv. Dr. Tabor recommends it to those who enjoy Pinot Noir. It’s not a Pinot, of course, but is produced from the Marechal Foch grape. Foch is a cold-hardy grape which has apparently found some favor in Iowa - the previous Iowa winery in the series, Schade Creek, makes good use of Foch grapes. The wine sells for $14. In the glass the wine looks very dark - light barely gets through. Its inviting nose has extremely dark, old world aromas. Blackberry plays equally with tar, tobacco and anise. Denise said each time I sampled it that "it smells yeasty, like baking bread." As someone who drinks California wine a lot, the palate seems almost alien to my taste. Had I not known it was produced in Iowa, I may have guessed Spain. The fruit is quite restrained and a lovely minerality rivals it for attention. An herbal flavor comes just short of tasting green, and reminds me more of sage than bell pepper. The medium weight of the wine and the gentle tannins combine to make an extremely drinkable beverage. I see this pairing with a chicken sausage, or lamb, quite well.